Scientists say stocks of the Atlantic bluefin – which can grow to the size of a horse – have fallen by more than 80 percent over the last 40 years to around 3.2 million. European fishermen catch the fish when they congregate in tightly packed shoals to breed in the Mediterranean, preventing stocks from recovering. EU fisheries commissioner Maria Damanaki will propose to the bloc’s 27 Member States that they support listing the fish as endangered under the Convention on International Trade in Endangered Species (CITES), officials say. 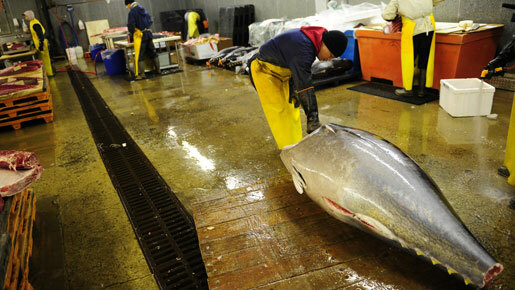 But she will also suggest a one-year delay to the ban on fishing that normally follows an ‘endangered’ listing. “Commissioner Damanaki’s aim is to ensure a viable future for coastal fishermen – that requires healthy stocks, and overfishing is not the way to go,” her spokesman told reporters. Damanaki will propose that any ban include exemptions for local “artisanal” fishermen working with lines from small boats, as opposed to the industrial fleets that created the crisis. The value of the trade is estimated at nearly $2bn a year, with about 80 percent exported to Japan where it is prized by sushi lovers and can sell for $200-300 per kilo. Most European countries have already expressed support for a ban, with Malta and Cyprus seen as the last EU opponents. But Japan is expected to fight hard against a bluefin ban at the next CITES meeting from March 13, and any move would need the backing of two-thirds of the 175 countries voting. The one-year delay – which France says is a condition for its backing – would give European fishermen another season to adjust, and would also allow action by ICCAT, the intergovernmental body for Atlantic tuna fishing. ICCAT, criticised by conservationists for repeatedly failing to cut quotas, will next meet in November. “We’re giving ICCAT one last chance to examine the scientific data and draw the relevant conclusion, which in our view is to ban the international trade,” said a Commission official. Greenpeace fisheries campaigner Saskia Richartz said a reduction in fishing quotas by ICCAT would not be enough. “The stock is in such a crisis state that any fishing would be a risk to the survival of the species,” she said.